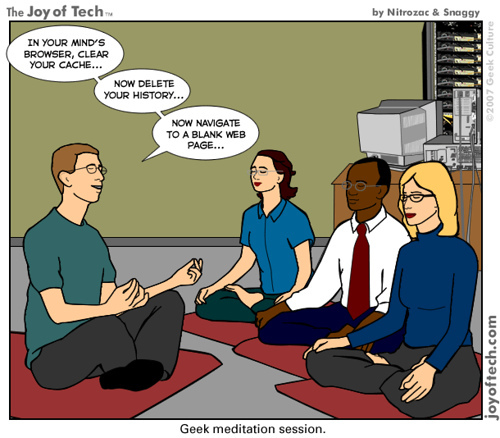 Do you want to start a meditation practice? Why not start today? It’s November 1, and we have about 50 people committed to meditating at least 5 minutes per day for the next 28 days! Facilitative Leadership, our foundational philosophy here at the Interaction Institute, is based on a set of seven practices. Our friends working on Transformative Change, also speak in the language of practices – see posts like framing deep change and It’s all two both! In my personal life, I’m becoming more and more aware of the power and importance of practice as a path to personal transformation. From our work on “change,” we are also learning a lot about the power of focus and attention. Whole sale change rarely works, even if thinking about it gets us very excited. This is why New Year’s Resolutions never last. From the Heath brothers and their book Switch, we learn that we have a limited bandwidth for change. Leo Babauta has built a whole career on the idea that we can build habits one at a time. Robert Maurer and his Kaizen method teaches us about the importance of starting with tiny steps. We are bringing it all together here as a way to experiment on our own selves. What does it take for us to change? How do we build a practice? What is the architecture of change that we need? Might publically checking-in every day be a way to get us to do what we are committed to doing? Let’s try it out. And let’s try it out in a way that supports our own inner journey, and the nurturing of our interior condition. This reminds me of one of our favorite quotes. “We are what we repeatedly do. Excellence, then, is not an act, but a habit.” Aristotle.